Weight: 155lbs, stocky with broad shoulders. Hair: Shaved close to the bone, brown. Disposition: Cheery, friendly and loyal to his friends. Though has a slight tendancy to slip into a black mood if allowed. Basic Info: A simple gravel belly during the Great North War. 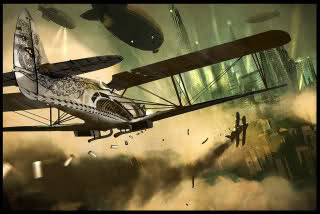 Survived 4 years in the trenches as a light line scirmisher before transferring to the Navy Airship Defence Corps. Is generally a light hearted rogue, who likes his drink. He can sometimes get depressed if allowed to think about the war. Erik tends to get himself into trouble with Port authorities when allowed a run ashore, thus he currently is "between" ships. If you can handle his slight mood swings, is a hard and dilligent worker, plus is a dab hand at the martial art of close in bar room brawling, and has a high pain threshold. Re: Who He? He me. Gimme a sec and I'll have the page up!